2013 marks the 150th anniversary of the first train journey on the London underground. Chances are that it was not particularly comfortable, as the engine was a steam locomotive. Anyone who has ridden the modern London underground can attest to how hot it becomes in the carriages during hot summer months and the grime that builds up on your skin over the course of travel. But it is a fun experience, as well as an effective method of moving around Britain's capital. 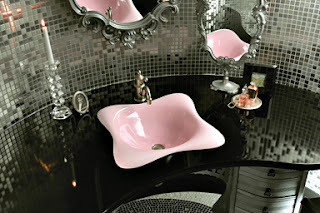 But I digress, after all this is a tile blog. Tile is used extensively on the underground. In the early days of the underground lighting was by means of gas lamps. To maximize the light, reflective white tiles were applied to the stations. With the widening availability of electric lights at the beginning of the twentieth century and the expanding of the underground service a new tile scheme was undertaken. Individual color and pattern schemes were established for the platforms, allowing even illiterate travelers to arrange meetings and know where they were going: If the station had green tiles with a brown pattern on an off-white background then it was Trafalgar Square. The tile suppliers used innovative methods to ensure their tiles would grip well and remain in place. It is difficult to get the tiles to release intact even after a century² . Over time station names have changed, so the tiles were painted over to conceal the old names. In recent years many of the stations on the underground have, or are, undergoing renovation. That tiles have been in service for 100 years speaks to their hardwearing resilience in adverse conditions. The restorations vary from tear downs with the complete loss of the Edwardian patterns, to tile replacements faithful to the original designs¹ . The tile designs at some stations reflect famous places found above ground. Finsbury Park on the Victoria Line has balloon mosaics in reference to the balloon launches at the park. Baker Street has the silhouette of a famous fictional detective, who lived at Baker Street, on its walls. The tiles used to create the silhouette are themselves patterned with the silhouette creating a unique halftone. South Kensington is decorated with scenes reflecting the Natural History Museum. In 1903 Leslie Green, architect, was tasked with designing stations for three railway lines. His Arts and Crafts designs can still be recognized by their ox-blood red glazed terracotta block facades†. The relief tiles of the ticketing halls are largely lost due to remodeling and the installation of self-service ticketing machines² . Some of the decorative tile on the City Line, from Carter's & Company of Poole, can still be found at City Line stations³ . An increasing amount of people are cooking made-from-scratch meals. Whether it includes a personalized breakfast granola mix, a lunchtime sandwich that incorporates heirloom tomatoes, dinners that include the use of a tagine, or desserts that urge the food connoisseur to wander the garden for a sprig or two of lavender, growing your own food and using fresh, organic ingredients has seen a resurgence. With this renewed back-to-basics philosophy, homeowners have found the need to refresh the look of their kitchens, be it with new, energy-conserving appliances or a fresh coat of paint, the need for a soothing, yet workable environment trumps even the most prudent of budgets. Happily, along with this desire for something new and different, tile backsplashes have seen an uptick in updated kitchen designs. Not only is a tile backsplash functional with its easily cleaned surface, but I tend to think of it as a showpiece or focal point of the cooking area. Even though I’m partial to the Moorish look, I seem to be drawn to mixed mosaics each and every time. 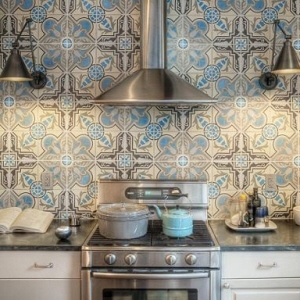 Perhaps when we finally we remodel our kitchen, my love for Moorish and Spanish tile will have its overdue moment in the spotlight. 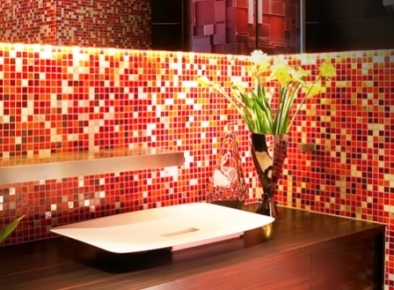 Lastly, thanks to the technological advances within the tile industry, no design, pattern or material is out of reach or impossible to mimic. I’m sure we’ll be seeing many more advances in the coming months with Cersaie, the Italian tile exhibition held in Bologna, Italy September 23-27, 2013; Cevisama, the Spanish tile exhibition held in Valencia, Spain, February 11-14, 2014); and Coverings 2014, set for April 29-May 2, in Las Vegas. 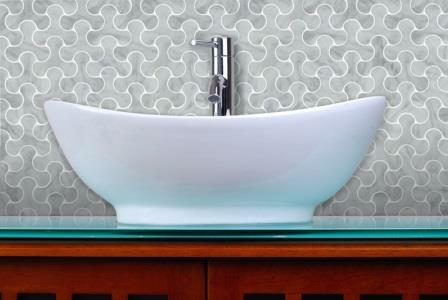 Which pattern, color, or material of tile would you choose to serve as the culinary inspiration for your kitchen, or to create a spa-like surrounding in your bathroom? When I set out to write this blog article, I intended to put a few words to a photograph of the Poole Arms (in Poole, Dorset, UK,) with its striking green tile façade. Being interested in history, I decided to research some information on the building and its tiles. The Poole Arms is perhaps the oldest pub on the quay. Parts of the building date from the 1600's, and it's been known to have been satisfying the thirst of sailors in 1826†. As I dug into the history, I found myself asking when the tile façade was added to the building. My first break came when I learned of Jesse Carter and his purchase of a bankrupt tile and pottery business in Poole in 1873‡. Carter's Tiles, which eventually became Poole Pottery, had supplied the tile for the Poole Arms, as well as other public houses far and wide. According to The Virtual Museum of Poole Pottery, breweries adopted the practice of ceramic tile façades in the early 1900's. Green was the livery of Portsmouth United Breweries, which was taken over by Brickwoods, which was then taken over by Whitbread. The Swan Inn is an example of Carter's hand-painted tiles. As it was. Carter's Tiles became known for hand-painted and themed tile panels. Hand-painted tile scenes graced the walls of butchers, fishmongers, and greengrocers. Scenes from fairy tales, and nursery rhymes decorated the walls of children's hospitals and schools. City councils, department stores and even shipping lines commissioned works of tile art from Carter's. While the hand-painted tile displays were appreciated for their decorative appeal, it was their hard-wearing, easy-to-clean and sanitize finish that made them an appealing choice. The walls of the London underground are graced by Carter's Tiles (more on that in a later post). The Swan Inn viewed now by Google Street View. Sadly, many of the hand-painted murals created by Carter & Company, and later Carter, Stabler & Adams, are being lost as structures are renovated to modern tastes, or demolished, and the value of the tiles is not appreciated. There are, occasionally, some happy discoveries. When Kent and Sussex Hospital in Royal Tunbridge Wells closed for renovations, tile animal panels were discovered, painted and boarded over. The panels were removed and, with the exception of a rare ark mural panel which was installed in a new hospital, restored and sold at auction. † Beamish, Derek, John Dockerill, and John Hillier. The Pride of Poole 1688-1851. Poole: Poole Historical Trust, 1988. Print. The sight, taste, and smell of freshly picked fruits and vegetables, from either your own garden or from your local farmer's market, appeal to the inner chef in all of us who love to eat and share our latest culinary creations. With summer's bounty also come the planned, and sometimes impromptu, gatherings and get-togethers. 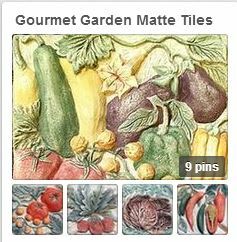 You can keep the memories and feelings of summer alive throughout the year with our ceramic Gourmet Garden Ceramic Tiles and Fruit, Floral and Vegetable Garden Murals. Beautiful glazes and intricate relief designs are just a few of the wonderful traits our collection of ceramic Gourmet Garden tiles and custom murals offer. With their hand-painted relief details, available either in a matte or gloss finish, these richly colored tiles boast sophisticated designs inspired by nature's bounty. 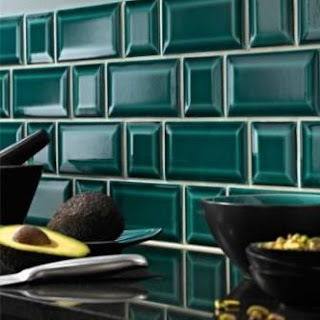 You can combine our individual garden tiles with solid colored ceramic or stone tiles, rope borders, pencil liners, or you can opt for our Garden Tile Murals for an increased visual impact for your kitchen backsplash. No matter which option you choose, you'll be adding long-lasting, beautiful and aesthetic value to your space. Our Gourmet Garden Gloss tiles create a classic kitchen theme of fresh-picked fruits and vegetables from the garden or the local farmer's market. The matte finish of this collection of matte tiles perfectly accents tumbled stone, like travertine or marble. Our Ceramic Tile Fruit Basket Mural brings to life the classic theme of freshly picked fruits. Measuring 18"x18", hand-painted ceramic tile mural is accented with a border of rope liner for added visual interest. Our relief hand-painted ceramic tile Bouquet Mural includes the rope trim and looks perfect when paired with natural stone, such as travertine or granite. The intricate details in this mural make it a work of art. Our Pinterest board selection for this month was inspired by our own garden harvest of hearty eggplants, luscious grapes, and juicy plums. Together with summer's bounty of purple fruits and vegetables, and our collection of Gourmet Garden Ceramic Tiles, we thought we should pay homage to all that nature offers. 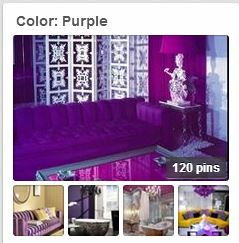 For more ceramic tile design inspiration, check our pages on houzz.com, our boards on Pinterest, and browse through dozens of our Ceramic Tile Design Ideas portfolio page where you can find a large collection of projects showcasing our handmade and hand-painted ceramic tile, cement tile, decorative tile, mosaic tile, and so much more. 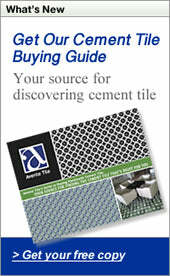 Let us know how we at Avente Tile can assist you!